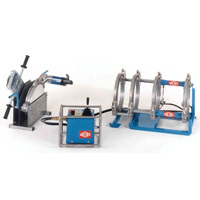 Miniplast Shop/Field Welders are light and compact, and adjustable, which allows for welding and fabrication of piping systems and custom pieces in installation work. The removable planer and base allow its use in tight spaces or at ceiling level. The unit comes with all insert sizes and tools. Features: Horizontal and vertical adjustment, compact design, ability to make angle welds and built-in force gauge. Maxiplast Shop/Field Welders are light and compact, and adjustable, which allows for welding and fabrication of piping systems and custom pieces in installation work. The removable planer and base allow its use in tight spaces or at ceiling level. The unit comes with all insert sizes and tools. W-Series Shop/Field Welders are field hydraulic units with double clamping but the outer fixed side clamp and base can be easily detached, making this unit capable of welding in tight spaces. The electro-hydraulic control unit operates the clamps and controls the welding forces. The electronically controlled heating element has a digital display, control lamps, an on/off switch and a connection cable with shockproof plug. Both the heater and planer sit in a heat-protected storage box when not in use, and plug directly into the electro-hydraulic control box for convenience, avoiding multiple extension cords. Features: Compact design ideal for inside trenches, breaks down to 3 clamps for tight spaces, rugged frame for industrial applications, adjustable speed to control change-over time, adjustable heating element temperatures, powerful planer with safety shut-off switch, can do vertical or horizontal welds.